Proprietary Name: Signature Care Sensitive Maximum Strength What is the Proprietary Name? Non-Proprietary Name: Potassium Nitrate, Sodium Fluoride What is the Non-Proprietary Name? Signature Care Sensitive Maximum Strength with NDC 21130-351 is a a human over the counter drug product labeled by Safeway. 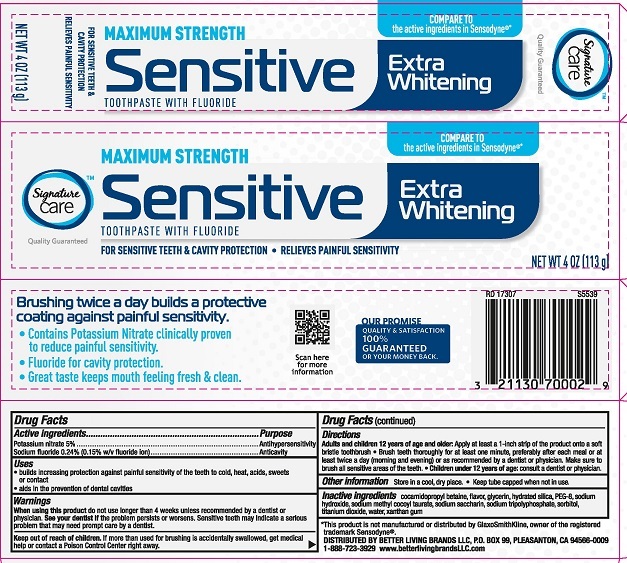 The generic name of Signature Care Sensitive Maximum Strength is potassium nitrate, sodium fluoride. The product's dosage form is paste, dentifrice and is administered via dental form. Start Marketing Date: 03-02-2019 What is the Start Marketing Date? When using this product do not use longer than 4 weeks unless recommended by a dentist or physician. See your dentist if the problem persists or worsens. Sensitive teeth may indicate a serious problem that may need prompt care by a dentist. Directions Adults and children 12 years of age and older: Apply at least a 1-inch strip of the product onto a soft bristle toothbrush. Brush teeth thoroughly for at least one minute, preferably after each meal or at least twice a day (morning and evening), and not more than 3 times a day, or as recommended by a dentist or physican. Make sure to brush all sensitive areas of the teeth. Minimize swallowing. Spit out after brushing.Children under 12 years of age: consult a dentist or physician. Other information Store in a cool, dry place. Keep tube capped when not in use.